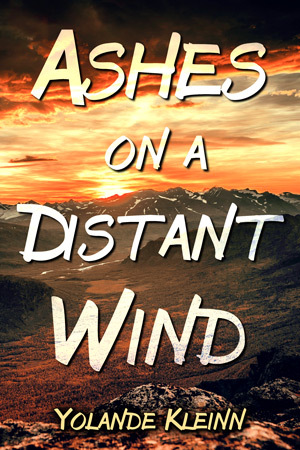 Ashes on a Distant Wind is part of Less Than Three Press's Devil's Land collection. Beau put the truck in gear and drove as fast as he dared, covering as much ground as he could before the last of the sun set. He had to slow down then for safety, but a full moon above meant he didn't have to risk using the headlights. He navigated cautiously, stuck to the clearest paths and the highest ground, until he found a natural gap between hills. It was the best location they were likely to find tonight, and he parked the truck with a lurch. They'd have to risk a fire. He needed more than moonlight for stitching, but at least here the light wouldn't be visible at a distance. They made camp quickly and carelessly, and despite his arm Riggs made a fire while Beau unrolled the small pack of supplies he would need. Riggs was moving even more gingerly now, and from the dark crease between his brows he was really starting to feel his open wound. Beau watched Riggs untie the sodden cloth from around his arm and shrug painfully out of his jacket, then had to help tug the ruined shirt up and over Riggs's head. The bare lines of Riggs's chest cast strong shadows in the firelight, firm muscle and plenty of scars. To Beau's credit, it only took him a couple seconds to tear his eyes away and turn his attention to the task at hand. "Here." He tossed Riggs a bottle of moonshine from their bags—vile stuff, but effective for more than one purpose. He watched Riggs knock back a generous swallow with a scowl that belied the taste, then snagged it back from him. "Steady on," Beau murmured, and without warning he poured the alcohol over the gash in Riggs's arm. Riggs made no sound, but his whole body tensed at the sting. The muscles of his throat strained visibly with the effort of silence. The second Beau was finished, before he could recap the bottle, Riggs snaked it back and took another long swallow. He'd be loaded fast if he kept that up, but as long as he could sit still, Beau didn't plan to protest. He had no way to sterilize his hands, but he did have a box of clean rubber gloves, and Beau tugged a pair on before getting busy. He worked efficiently, as quickly and carefully as he could, placing his sutures in an even row as Riggs stared into the fire. Only after Beau secured a heavy bandage around his finished work did Riggs recap the bottle of rotgut and set it aside. Beau studied Riggs's fire-lit profile, the tired lines of Riggs's face, and did his best not to let his eyes wander downward. It wouldn't do to have Riggs catch him staring. That way lay more awkwardness than Beau was in the mood to cope with tonight. "Better?" Beau asked. He was startled when Riggs turned and caught him with a fierce look, eyes far too sharp for the amount of alcohol Beau had watched him drink. "Always," Riggs said. Then, still staring hard and speaking in a voice gone gruff, "You should be more careful." Beau blinked at him, incredulous. "I should be more careful?" "You almost took a bullet today, trying to save my neck. That's not a fair trade." Anger sent a spike of cold along Beau's spine, set his heart racing furiously in his chest. He could feel a fight coming—an argument that wouldn't do any damn good even if Riggs were sober—and it was only with enormous willpower that Beau kept his voice bland as he answered, "Who says you get to make that call?" Bland or not, the words were still a deliberate goad, and Beau was surprised when Riggs failed to rise to the bait. Riggs's eyes cut away, towards his own unopened pack near the fire, and he reached to tug it closer, spent a silent moment digging inside for a clean shirt. Beau didn't offer to help him shrug into the fresh garment or button it up the front, even when Riggs gave up with five buttons left to go and the collar gaping open. The silence stretched unsteadily between them, and several minutes passed before Riggs turned to face him. The rough edge of his voice had turned confessional now, an uncomfortable honesty that made Beau's face heat and his heart pound. The words were like nothing Beau had ever heard out of Riggs's mouth. "I can't lose you, Beau. Haven't got anyone else left that's mine." Mine, he said. Like whatever kept them together, guarding each other's backs, was so basic and simple it could be summed up in that one word. It made Beau feel secure, safe, in a way he'd almost forgotten was possible. It also made him feel too exposed, and he smiled uncertainly. "I don't think I've ever seen you this drunk before. Makes you almost charming." But for all the forced lightness in Beau's tone, Riggs just held him in that too-intense stare. The smile, weak to begin with, faded from Beau's mouth in the quiet. He couldn't keep meeting Riggs's eyes, so he shifted where he sat and stared into the fire instead. He realized belatedly that he was still wearing the bloodied pair of gloves, and he tugged them off slowly, letting them turn inside out as he peeled them from his hands. He didn't dare raise his eyes again; he was too nervous about what Riggs might see.